From the Abstract: Over the last 23 years, the U.S. Securities and Exchange Commission has required over 34,000 companies to file over 165,000 annual reports. These reports, the so-called “Form 10-Ks,” contain a characterization of a company’s financial performance and its risks, including the regulatory environment in which a company operates. 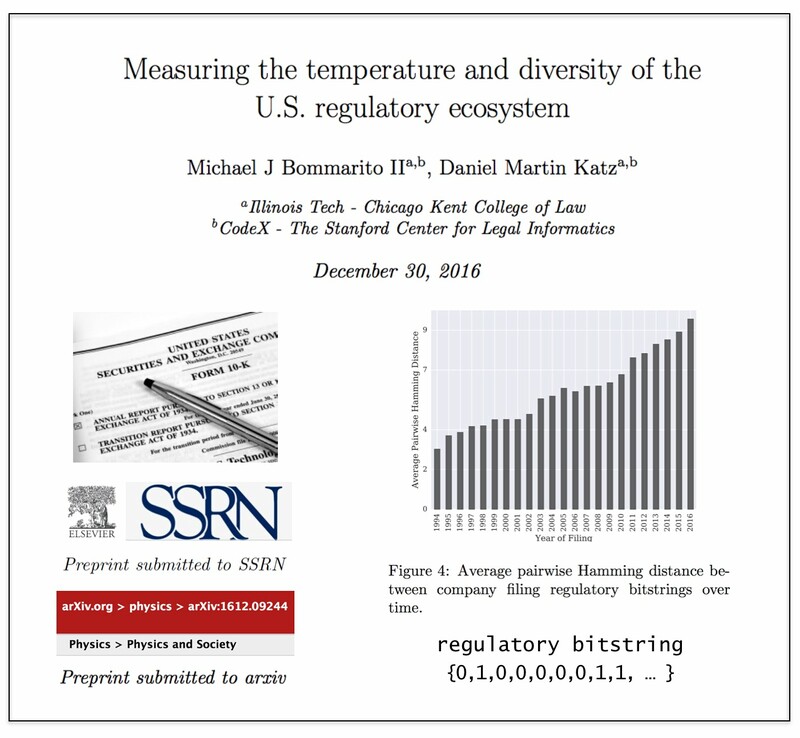 In this paper, we analyze over 4.5 million references to U.S. Federal Acts and Agencies contained within these reports to build a mean-field measurement of temperature and diversity in this regulatory ecosystem. 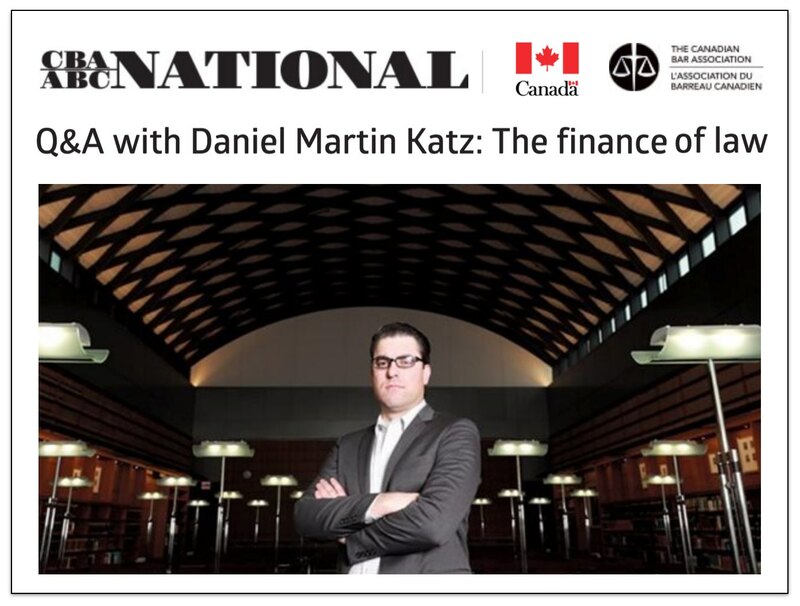 While individuals across the political, economic, and academic world frequently refer to trends in this regulatory ecosystem, there has been far less attention paid to supporting such claims with large-scale, longitudinal data. In this paper, we document an increase in the regulatory energy per filing, i.e., a warming “temperature.” We also find that the diversity of the regulatory ecosystem has been increasing over the past two decades, as measured by the dimensionality of the regulatory space and distance between the “regulatory bitstrings” of companies. 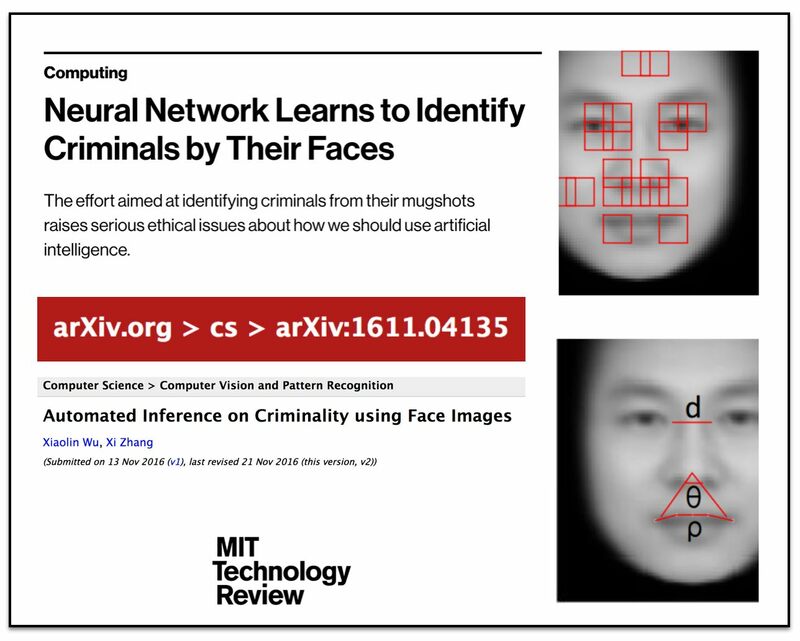 This measurement framework and its ongoing application contribute an important step towards improving academic and policy discussions around legal complexity and the regulation of large-scale human techno-social systems. Available in PrePrint on SSRN and on the Physics arXiv. We have added three times the number years to the prediction model and now predict out-of-sample nearly two centuries of historical decisions (1816-2015). Then, we compare our results to three separate null models (including one which leverages in-sample information). 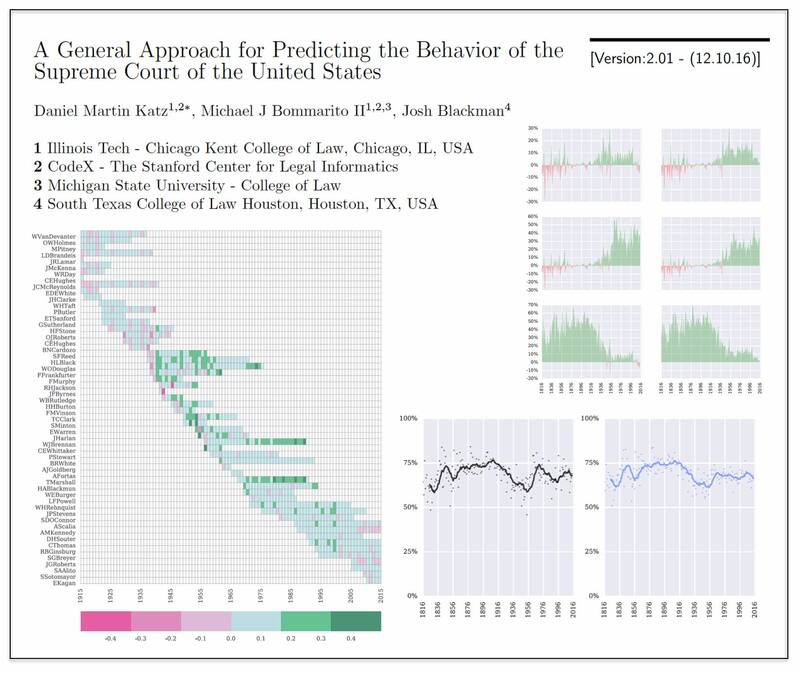 Here is the abstract: Building on developments in machine learning and prior work in the science of judicial prediction, we construct a model designed to predict the behavior of the Supreme Court of the United States in a generalized, out-of-sample context. Our model leverages the random forest method together with unique feature engineering to predict nearly two centuries of historical decisions (1816-2015). Using only data available prior to decision, our model outperforms null (baseline) models at both the justice and case level under both parametric and non-parametric tests. Over nearly two centuries, we achieve 70.2% accuracy at the case outcome level and 71.9% at the justice vote level. More recently, over the past century, we outperform an in-sample optimized null model by nearly 5%. Our performance is consistent with, and improves on the general level of prediction demonstrated by prior work; however, our model is distinctive because it can be applied out-of-sample to the entire past and future of the Court, not a single term. 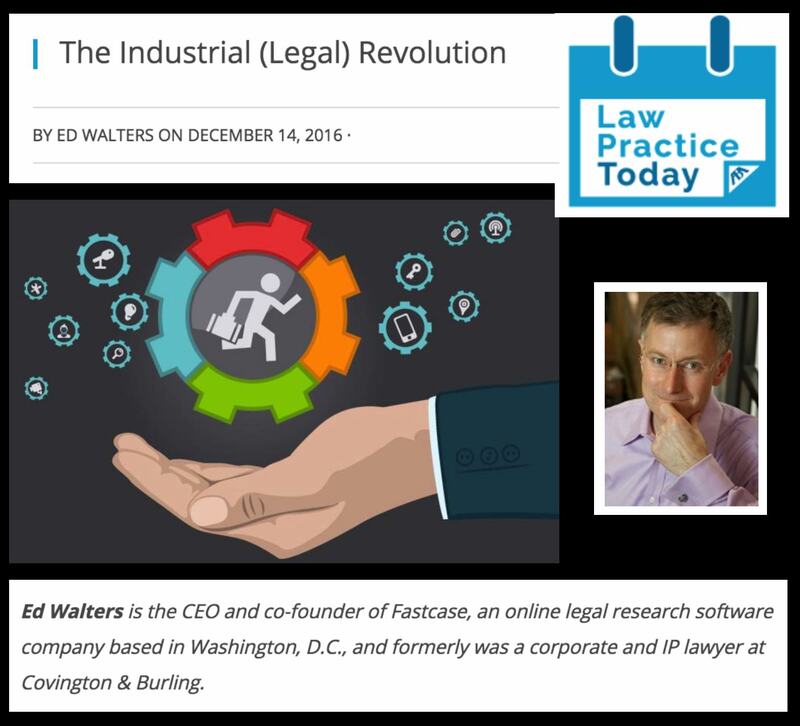 Our results represent an advance for the science of quantitative legal prediction and portend a range of other potential applications. 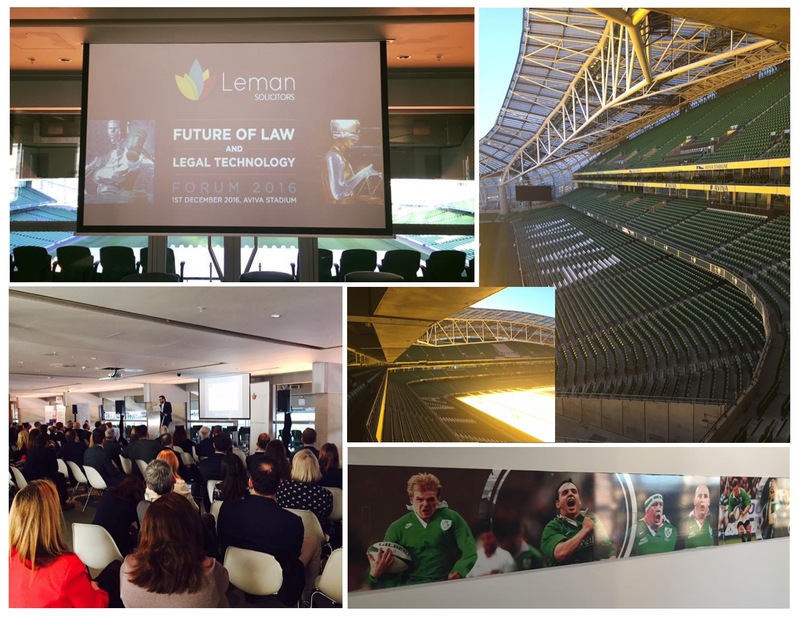 Enjoyed delivering the Keynote Address at the #FutureOfLaw Conference here at Aviva Stadium in Dublin, Ireland. Thanks to Leman Solicitors and all of the sponsors for this wonderful event!